The "Dual Class-A II Output" (DCAO2) is a high current audio line amplifier capable of driving low impedance headphones or long, highly-loaded, audio cables. This listing is for a bare PC board. A unique circuit topology similar to the original Dual Class-A pre-drives a discrete pair of BD139 and BD140 power transistors to provide a highly-linear, low distortion, Class-A output capable of providing very low distortion while running open loop. The DCAO2 improves on the original Dual Class-A to provide voltage gain and the option of overall global feedback for a very low "0 Ohm" output impedance and Class-A/B power extension from 100 mW to >1W. The Dual Class-A II is ideal for both hard-to-drive high impedance and low impedance headphones. With 600Ω loads the maximum power output is 125 mW. At 15Ω loading the maximum output power is 2.8W. 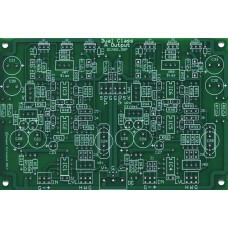 The unique Vbe "voltage mirror" differential bias and "common mode" pre-drive circuit topology of the Dual Class A II provide very low distortion low DC offset and tight bias current control. DC bias current control is closed loop using both local voltage feedback within the predriver and thermal feedback taken from the device heatsink. With the exception of a single interstage film capacitor to block input offset, the design is fully DC-coupled and does not require a servo to provide DC stability. When operating open loop the Dual Class-A II output stage has an output impedance that is <2 Ohms. When running closed loop the output impedance is approximately 40 mΩ for a true "0 Ohm" output. In either configuration the DCAO2 is stable with highly-capacitive loads. Input jumpers permit both channels to (1) operate fully independently with single-ended outputs, (2) in parallel for distribution amplifiers or paralleled output, or (3) cross-coupled for fully-balanced outputs and line "re-balancing" applications. A volume control insert point with an optional film (or electrolytic) inter-stage coupling capacitor are provided for use as a stereo headphone amplifier. An input level trim pot is also on board. • A stereo class-A headphone amp. • A stereo (unbalanced) class-A line output. • Mono fully-balanced line output with cross-coupled differential input. • A high-current line "re-balancer." • Stereo (single-ended) or Mono (differential) transformer driver. • Dual output distribution amp. • Parallel operation for double the output current without external ballast resistors. • Passive EQ network driver. • Control Room Monitor Switcher/Amplifier driver. • A Simple Direct-Coupled 10W Class-A Power Amp. • A few more things we haven't thought of yet. Schematics, performance, construction and other information for the Dual Class-A II Output can be found here on the Pro Audio Design Forum. 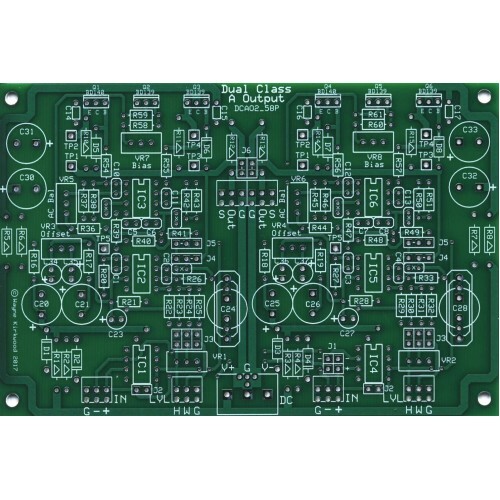 The Dual Class-A II is sold either as a bare PC board which does not include any components or an assembled and fully-tested module. For DIY builds a Mouser Electronics Project Manager bill-of-materials are available here.